than the one we're going to talk about. Did Jefferson have any idea what a burden he was bequeathing to the new country his Declaration of Independence was forming? Because I do believe the American obsession with happiness is directly related to the most famous phrase in all American history, and the only thing most Americans think the Declaration of Independence said: America is all about the pursuit of happiness. Which is all about Lucy. And what is it about Lucy? And that is the most important thing about Lucy you can possibly know! Lucy is not entirely happy! Hey, guys, pursuit of happiness! So why hasn't Lucy caught it, yet? What good is the American Dream to Lucy if she isn't happy? Isn't this like in our national charter, or something? I remember that period as being the postwar '50's and '60's. Inflation chewed everyone alive in the '70's, there were major recessions, layoffs, collapses in the '80's, including the savings and loan industry (that one just flat disappeared); a major real estate bust in Texas, Arkansas, and other parts of the country. The only way inflation was stopped was interest rates the Fed set so high the economy practically came to a standstill. Reagan was livid, until inflation went away and rates went down and the rich started getting richer while the poor wondered what truck just ran 'em over. Unprecedented prosperity? For whom? Tuition at Texas state universities in the '70's was $4.00 an hour. You read that correctly; $4.00 a semester hour. It hasn't been that low since, and it started rising in the '90's (or was it the '80's? Whenever the de-regulation urge took hold). If we're gonna talk about recent history, let's get it right. But let's get back to the "pursuit of happiness," because this is the problem at the root of Lucy's delusion. And what is Lucy's delusion? (I'm leaving out the graphics because I assume you are not Gen Y'ers, and therefore can actually, you know, read words). Well, I suppose it is; but I still think the root problem is that you think it is your divine right as an American citizen to not only pursue happiness, but to have it in handfuls; to be able to store it in grain silos against drought and famine, to have stores of cups of happiness running over where ever you look in your house; to never even have to worry about running low on your stock because, hey, you're an American! Happiness is your birthright! Is it? Is that it? Are we supposed to be happy? Is that what we're supposed to be about? Now here's where the interesting dichotomy comes in: I don't know anyone who thinks like this. I don't know anyone who truly believes the birthright as an American is to be happy, that the sole purpose and goal of their existence is to obtain happiness and keep it until the day they die; that their life is measured entirely by the content of the happiness it was filled with from cradle to grave. 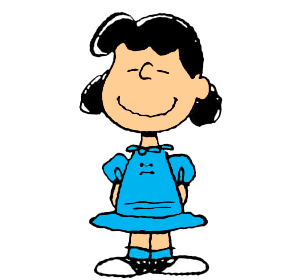 Of course, I don't know anyone who thinks like Lucy, either. But we love these vague and glittering generalities, when it comes to public discussions. Or maybe we don't love 'em at all, which is why most people aren't engaged in these public discussions. My wife is too busy to pay attention to nonsense like this. My daughter is too self-aware to take this kind of crap seriously. And where does that leave me?, you may well ask. My parents' generation was not the "Greatest Generation." The boomers didn't come of age in the greatest economic expansion in our nation's history: they were born into it. Why do you think so many Boomers could afford to go to college and protest the Vietnam War? Because of Reagan, or because the Fed whipped inflation? By that time the protesting Boomers were already in the workforce raising families of their own, going from hippies to yuppies (am I the only one who remembers yuppies and preppies and inflation and the savings and loan collapse and about 3 major economic reversals in the last three decades of the last century?). And by that time the rising tide of economic expansion which floated all boats was already receding: war time spending was draining away (it always boost things when the government buys lots of stuff that industry builds); the power of the unions which built Detroit and made working on the assembly line a good middle class existence was going away; the destruction of Flint, Michigan had begun (Michael Moore's "Roger and Me" came out in 1989, during that "greatest expansion evah!" Already the rising tide was leaving many boats high and dry as it receded.). Generation "Y" isn't a bunch of gypsies who think they are entitled to happiness and prosperity without actually doing anything for it. She's also part of a yuppie culture that makes up a large portion of Gen Y. Now, unless the term "yuppie" has stopped meaning "Young Urban Professional" (or persons similarly situated), there's simply no way "a large portion of Gen Y" is part of a "yuppie culture" unless by Gen Y we don't mean "the generation born between the late 1970s and the mid 1990s" but rather mean "a tiny economic elite born between the late 1970s and the mid 1990s." Which is a whole different kettle of fish, I'm sure you'll agree. The critique of generalizations is a sidebar, however; it is related, not to reality, but to the nature of "national discussions" we tend to have. It is a generalization to say all Americans are obsessed with the "pursuit of happiness," but being happy is the conversation we all seem to have about ourselves when we talk about our national self. There again, a lot of people seem to feel left out of the conversation and so they don't participate in it, but we go on being concerned with our national sense of, and perhaps right to, happiness. Yuppies, by definition, benefit from the unrestricted operation of the capitalist economy; and if they also are, by definition, the most important cohort of a "generation," well, then, happiness is their birthright. The rest of us, not being yuppies expecting the world to offer us the life to which we have become accustomed, are just trying to get by. What's happiness go to do with it? Happiness, in other words, is a great thing: but is it the purpose of life? I want to say that's what Americans think, but that's ludicrous. I don't know anyone whose happiness rises and falls on their own sense of their...well, happiness. But that's the idea promoted in arguments like the one above: that the central obsession of young Americans today (who are mostly yuppies, so that already limits how many "young Americans" we are talking about) is literally the pursuit of happiness. So how can we now assume some cohort of the American population is that shallow and silly? I've wondered, over and over, whether or not Americans obsess over happiness more than other nationalities, mostly out of a combination of arguments like this about what generations are like, and over the importance in the American historical identity of that famous phrase of Jefferson's. I want to say the "pursuit of happiness" is part of a spiritual pursuit, a la Augustine ("Our hearts are unhappy until they are happy in Thee."). But that's nonsense, too. I'm not sure nations or cultures can have spiritual pursuits; not, at least, in a manner that actually means anything. That's thinking along the lines that America is "special" and must be judged by its intentions, not its outcomes. So whenever we kill civilians with bombs or bullets or just plain old warfare, it's "collateral damage" and shouldn't be held against us because our national heart is in the right place, and we only mean, like the Navy now says, to be "a force for good in the world." Even if we have to kill lots of people to do it. "Making sure we own the latest electronic gizmo before it hits the market" or even "Knowing more today than I did yesterday." I've followed the last one pretty faithfully, and I can say from experience that if you make it too much your raison d'etre, you end up pretty much where Faustus did, just without the power to summon Helen of Troy. You may not end with the risk of damnation, either, but you'll end feeling rather like you are damned anyway. As for the former, is it really any different than wanting to own the latest anything? So are we really in the pursuit of Jeffersonian happiness rather than Augustinian fulfillment? Or is it both, and a little bit of neither. Do our lives and our ambitions for our lives actually lie elsewhere? If so, where is that? *yes, it may be I'm taking all this too seriously. But either this is very bad satire, or it's very bad reasoning; which would still make it very bad satire.